The first time I saw the Grand Canyon, twenty years ago, my former partner and I drove four hours from Las Vegas, pulled into a parking lot, walked 50 feet to the canyon rim, took some pictures, got back in the car and drove away. Ditto for Monument Valley, Natural Bridges and all the rest of the national parks we cruised through on that trip. By contrast, this August my husband and I stayed two nights in the Grand Canyon village. We slept with the windows and blinds open, got up at first light and piled on layers against the chill. 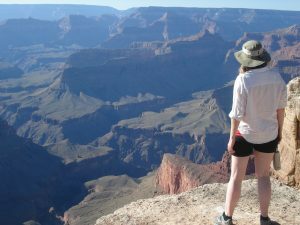 We walked eastward a couple of miles along the rim to our trail head, then switch-backed our way down into the canyon another mile or so before climbing out in the heat. In the afternoon, we hit the rim trail again for more miles of incredible vistas to the west. We watched the sun and a trio of chuckling ravens sink toward the unseen river, flowing miles below. In Monument Valley, we protected ourselves as best we could against the midday heat and hiked the Wildcat Trail, the only way into the park on foot. Every scrubby pinon sent me ducking for a patch of shade. It was grueling and electrifying. We saw nothing of the throng of visitors cruising the park road. No cars, no people, no sound. Just the silent company of giant stone structures. From there, we drove to Telluride, Colorado for Labor Day weekend. I’d never been before. It’s a little alarming that humans live in such a gorgeous place, surrounded by peaks so high you have to look straight up to see stars. At 9,000 feet, it was a struggle to climb one flight of stairs without panting like a fish. We rode the gondola to the mountain village over and over again and gaped. Our visit coincided with the annual film festival, and we were lucky enough to nab the last two seats to a free screening of Ethan Hawke’s new documentary, Seymour: An Introduction. Just before the lights went down, Cheryl Strayed and her husband Brian Lindstrom slipped in to occupy two chairs hastily set up on the side of the tiny auditorium. I knew they were at the festival for the North American premiere of Wild, the film based on Strayed’s memoir. I’d fantasized about running into her in a coffee line. Now she was sitting ten feet away. Seymour is a profile of the 87-year-old concert pianist and master teacher Seymour Bernstein. The film’s big message is about cultivating artistic courage. I blubbered through most of it, but the waterworks really got going when Bernstein talked about his father’s dismissal of his talent and the way he dealt with it: young Seymour would picture himself playing piano inside a protective cage where his father’s criticisms and humiliations couldn’t reach him. Hawke confessed to Bernstein that he suffered crippling stage fright, and Bernstein shared that he had worked hard to overcome the same fear through intensive preparation. If six hours of piano practice a day were not enough to feel mastery of a piece, Bernstein doubled that to twelve hours. As the final credits were rolling, I realized I had something urgent to say to Cheryl Strayed. I needed to thank her for the ballsy honesty of her work, and for emboldening readers like me to tell our stories without prettifying them or skipping the hard bits. To master our fear of ridicule and let fly with the truth. She was chatting with the people next to her. I stood waiting my turn. When she said hello, I could see she was a little teary-eyed, too. I introduced myself and then sort of blacked out. I remember her saying that Bernstein was talking as much about writing as music or acting. Talking directly to us writers. I remember thanking her for what her work has taught me about courage. She asked if she could give me a hug! And our road trip was only half finished. We rolled out of Colorado into the canyonlands of southern Utah, hiking our way through gorgeous, otherworldy formations, some of which I’d driven past years before. But hugging the edge of a sandstone cliff, hunting for petroglyphs, bashing my shins on wet river rocks—this time it was all about participating instead of watching. Wading in instead of hanging back. The first time I traveled this route, I thought my life was far from sacred. I believed that I didn’t deserve to be alive at all. That I should have died in the plane crash instead of Nancy, the way Dad wished I had. It was good enough for someone like me to sit and watch stuff roll past the window—that was as much “living” as I’d earned. This summer’s trip was a do-over, a reminder of how very different I am today from the woman who, twenty years ago, sat dejected and passive in the face of all that mysterious wild. It drove home how totally transformed my life has been by the hard work I’ve done to face my trauma. Slowly but surely, I’ve found the courage to reclaim my voice. To bring myself back alive. And I found a companion for the rest of the trip who challenges me to stay present for whatever turns up. Someone who always seems to find the wildest detour. Who loves life enough to get out of the car, and who loves me enough to hike for the view.